Semtech has established relationships with faculty members at various universities that offer specialized technical disciplines. These connections often result in exciting opportunities for college students to partake in. 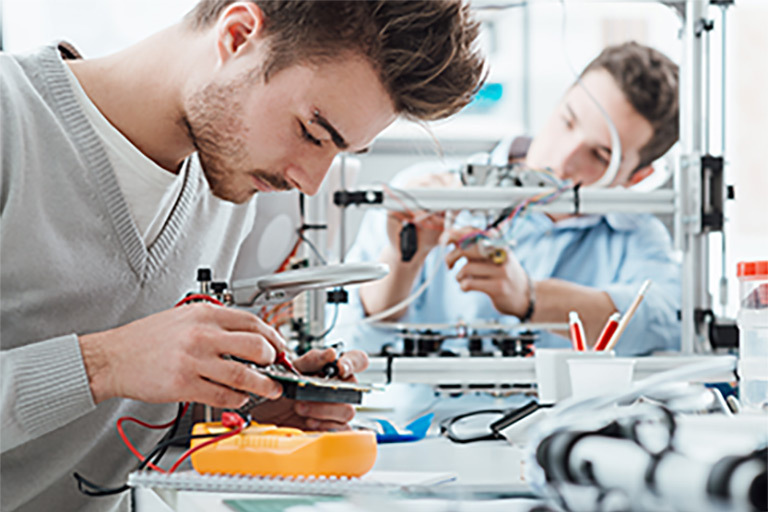 We regularly recruit students enrolled in ESD/EMI labs from the University of Missouri at Rolla, the University of Central Florida, and other universities offering renowned engineering programs. Check with your campus office to see if Semtech will be onsite at your college recruitment fair or apply today! Semtech internships offer students and recent graduates the opportunity to develop hands-on experience in a variety of fields, including engineering, business and information technology. While internships vary by department, each intern is exposed to the fast-paced high-tech industry and has the opportunity to problem-solve and develop applicable skills. Interns are paired with a senior level staff member for project assignment and direction. A scheduled development plan is implemented within the first two weeks of assignment with recurring meetings to assess progress and provide direction. A term review will be held at the end of your internship period to review project assignments and evaluate the results of your work. Ask questions, gain valuable presentation skills and acquire a better understanding of the business process. We are looking for passionate and driven individuals like you! Contact us directly for more information: internships@semtech.com. Our industry demands excellence, and we respond with solutions that push the boundaries of performance, size and capacity. What we do is beyond remarkable, and you could be a part of it.